SMOK TF-RDTA features big build deck, hidden sealing ring and juice flow control system, top filling and side airflow slots direct-to-coil design. With TF-RDTA, you can enjoy a strong and open draw like RDA. 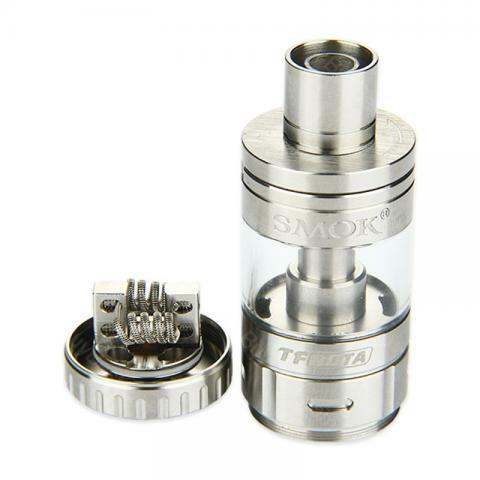 SMOK TF-RDTA Tank - 5ml features big replaceable deck, hidden sealing ring and innovative juice flow control system, swivel-cap top filling and side airflow slots direct-to-coil design. With TF-RDTA, you can enjoy a strong and open draw like RDA. Black color. • Before starting make sure your hands are clean. • Taking the TF-RDTA S2 deck apart. • Installing the pre-wrapped coil. Insert one end of your coil into the left-side holes, and the other end into the right-side holes. • Positioning and cutting the exceeding ends of wire off. Make sure the coil is fixed and lined up with the air hole, and also make sure the coil is NOT touching the deck. Then cut the exceeding ends of wire off. • Cutting a strip of cotton and make sure it’s just larger than the coil you built. • Inserting the cotton, and placing it in the middle. • Then guide the ends of cotton wick through the holes below. • Cutting the ends and make sure it’s not too short and not too long. • Wet the coil with your e-liquid and adjust the wick. • Warning: Coils must be checked for resistance before they are fired on a device, and re-checked periodically to ensure the resistance remains the same. • It comes with 510 thread. • You shall buy e-liquids separately at here. • Click download to get certificate: CE, ROHS. Schmeckt super und d?mpft recht gut. Benutze SMOK TF-RDTA täglich und er macht keinerlei Probleme. SMOK TF-RDTA Tank, totally recommend for its low price, good for beginners. And everything is fine.